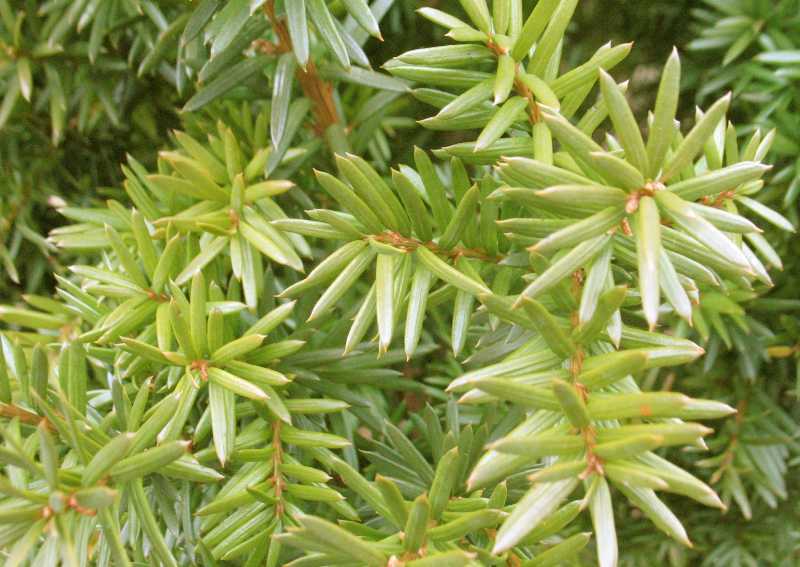 Yews are notorious for quickly yellowing and dying in wet or water-logged soil. Even a brief period of water-logged soil can result in root rot and plant death. 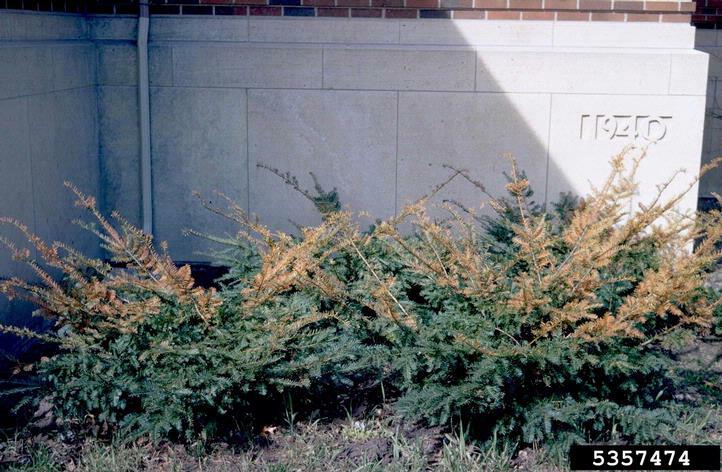 Dieback has been associated with yews growing in very acid soils (pH 4.7-5.4) or very alkaline soils (pH over 7.5). Symptoms begin with yellowing needles and thinning foliage worsening over several months until the plant dies. 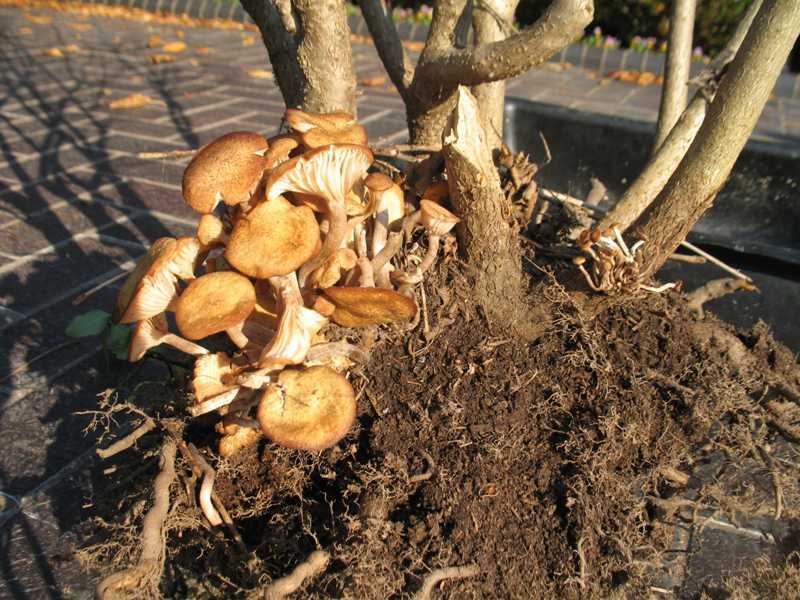 Armillaria is an aggressive root rot that can attack stressed or even otherwise healthy plants. The fungus girdles the base of the tree killing the cambium. Honey-colored mushrooms at the base of a plant (pictured) are the fruiting bodies of the fungus and are a sure sign of the disease. Plant death is quick. Do not replace with a plant susceptible to armillaria in the same location. Look-alikes: Any root problem can cause a plant to decline and die but the honey-colored mushrooms are distinctive to armillaria root rot. Heavy snow and low temperatures can result in brown twigs at the end of branches. To limit damage, prevent snow buildup on branches in winter. Remove snow carefully to avoid damaging branches. 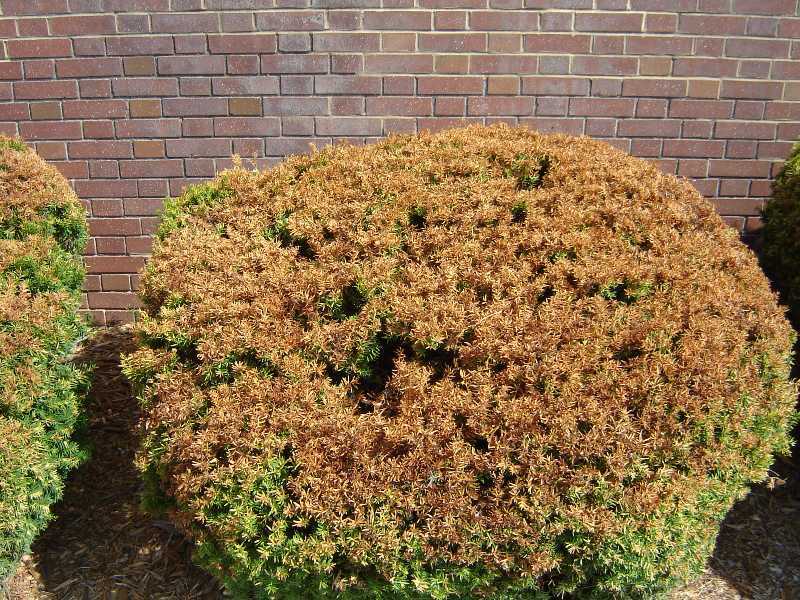 Late summer or fall pruning of yews can also result in tender growth that will be damaged or killed by winter temperatures. 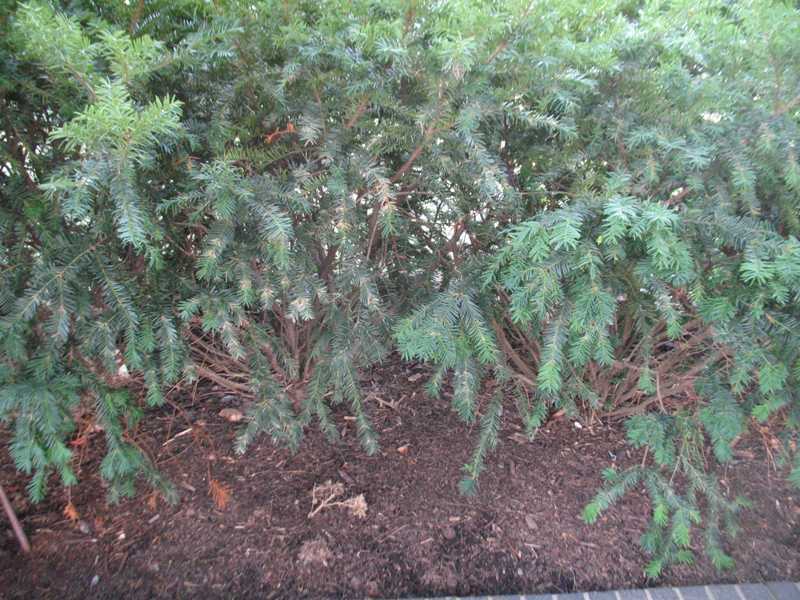 Improper pruning of yews can result in lower branches becoming shaded, which can result in sparsely needled or dying branches. Proper pruning keeps the top of the plant narrower than the base to allow for ample light. Salt spray on foliage can result in browning needles and dead branches. Repeated use of salt on roads or sidewalks can also result in salt building up in the soil, which can cause plants to decline and die. The distinctive pattern on these plants and verified use of salt use in winter make diagnosing the cause of this damage easy. 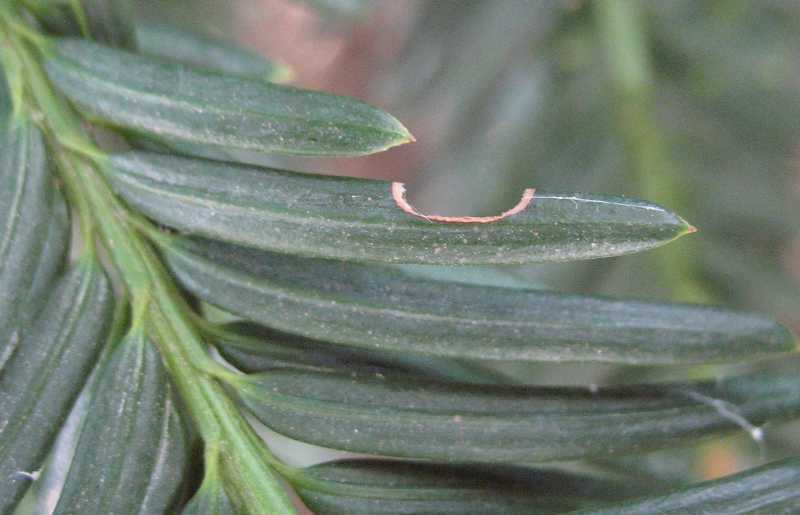 Yews planted in full sun locations or receiving additional reflected heat and light are subject to scorch, especially during periods of extreme heat and drought. Tender new growth resulting from shearing or pruning is most vulnerable. If damage is minor, growth may resume from the more protected areas below. 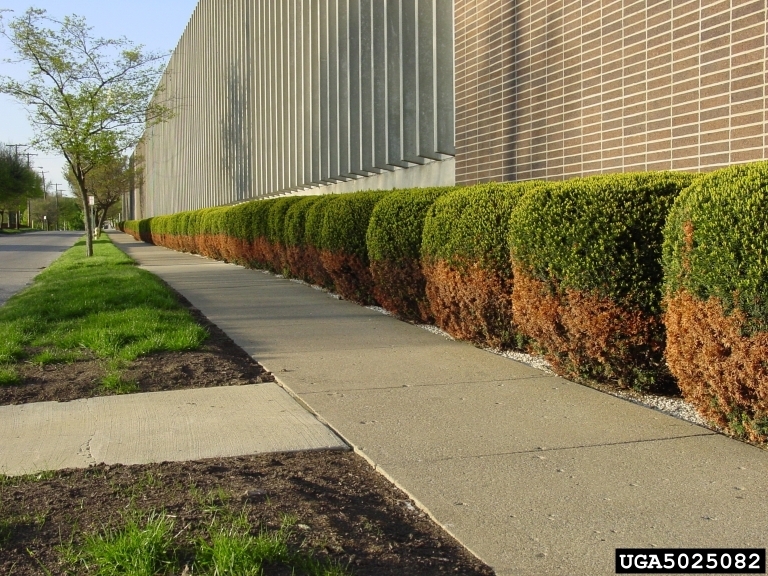 In the lower Midwest, yews are best planted in locations that receive some afternoon shade. 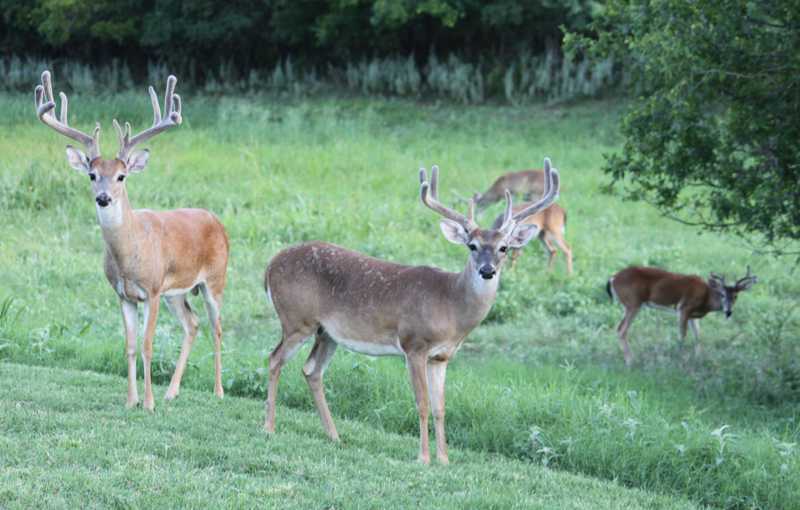 Deer feeding can seriously deform and damage plants. 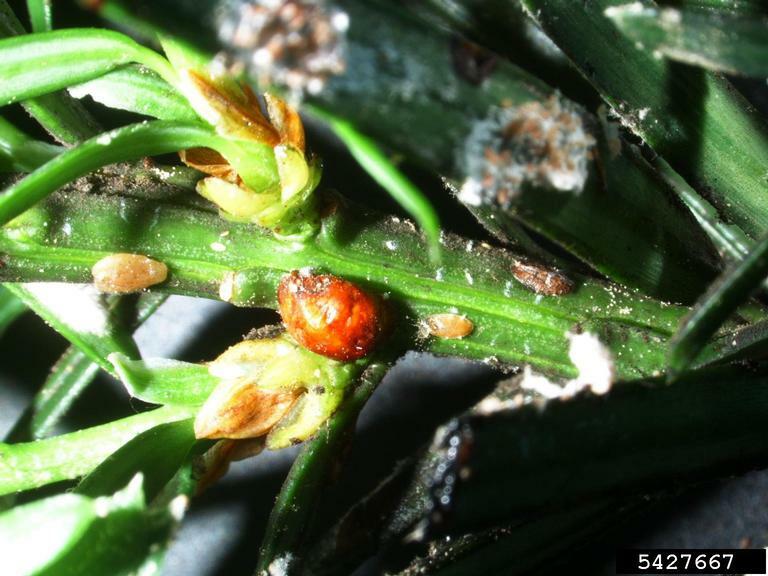 Both the larvae and adults of the black vine weevil damage yews. The larvae feed on the roots and usually cause only minimal damage. Adults emerge from the ground at night and chew small semi-circular holes in the edges of needles. In small numbers they do little damage. In some parts of the country scale may be found infesting yews. Look for a colored bump on a needle or stem that can be flicked off with the point of a knife or a fingernail. 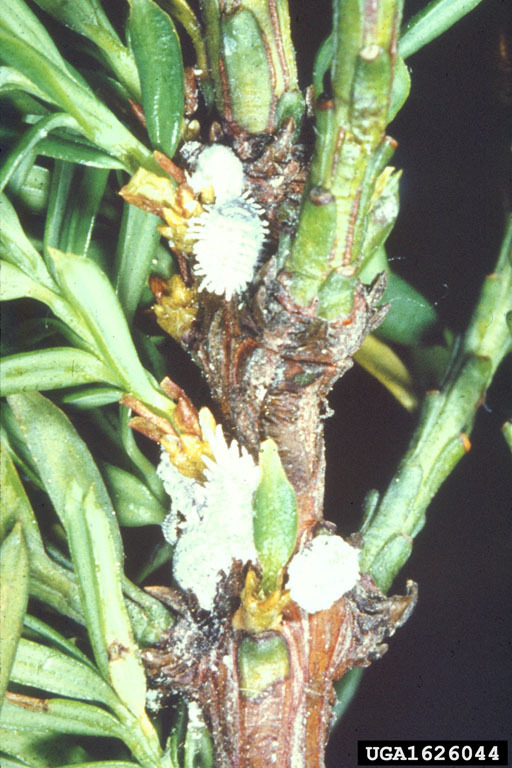 Objects below where scale insects are feeding may be shiny and sticky or blackened and sticky. In areas of the South and Southwest with light, sandy soils, root-knot nematodes can infest yews. 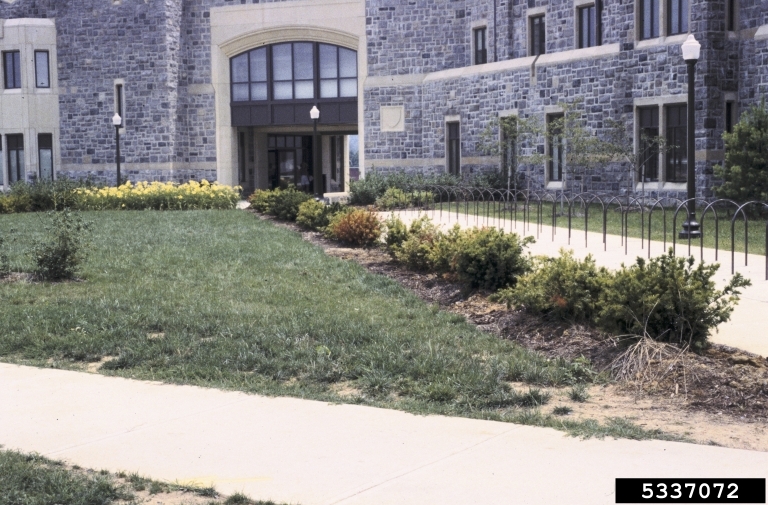 Above soil symptoms can be stunted, yellowing plants. 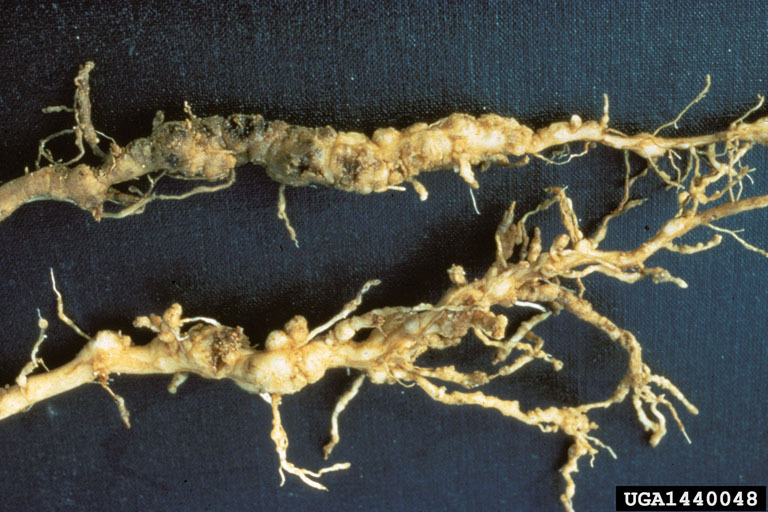 Examination of the roots will reveal root-knots in which the parasitic nematodes live.